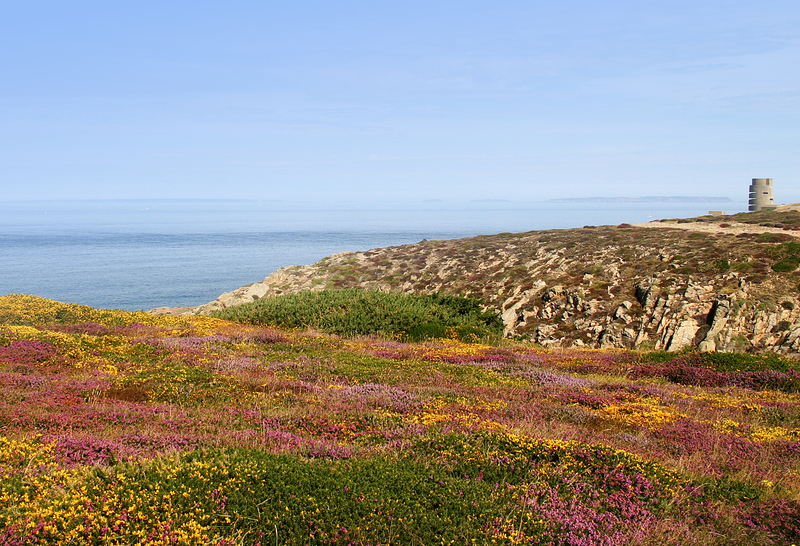 On 6th September things changed and, with the Ronez 2 pair back we had four other birds living in the quarry instead. Now, with four different, and very individual, birds out we had to learn again how to find each one. Several times a day. We managed to get some insects to all four birds by the next weekend but the wind and rain made it impossible to get adequate supplies down onto the ledges (think mealworms flying backwards over your head). On the 18th we became very worried about OR as his signal suggested that he was no longer moving and had been in the same spot for a while. 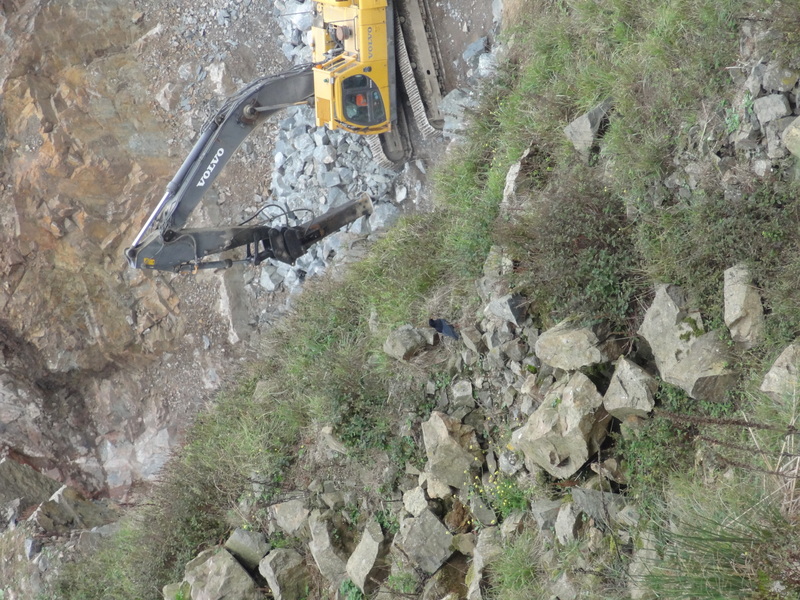 However, very sadly, while trying to pinpoint his exact whereabouts in a difficult area within the quarry, a second bird (WT) was collected freshly dead by Ronez personnel from the floor of the quarry. Gross post mortem results seem to point at starvation. This was very worrying as we were seeing the birds foraging, suggesting that either they can’t find anything suitable to eat or that they are very naïve in their foraging (we do not know how much food is even available as we cannot safely access the foraging sites). Immediately after the sad discovery of WT we watched the two surviving quarry birds (DB and BK) actively foraging but also flying around well, calling and looking fit and healthy. We accompanied the quarry manager in a further, thorough, attempt to locate OR but although we could get within a few metres it was unsafe to get right into the probable site we were getting a signal from. This meant we had effectively to write off OR as lack of any movement after more than two days could only really mean one thing. Losses like this, while upsetting to all involved, add to our understanding in this project and in fine-tuning the release. We always knew, and were pre-warned by colleagues who have led very successful release projects of this nature, that there would be losses along the way. As you can imagine though, the knowledge that losing some birds was inevitable did little to soften the blow. DB and BK continued to look good, looked fit and active and must have been getting at least some food. We gained too in confidence that as they settled into a routine we could supplement their food in the quarry more. 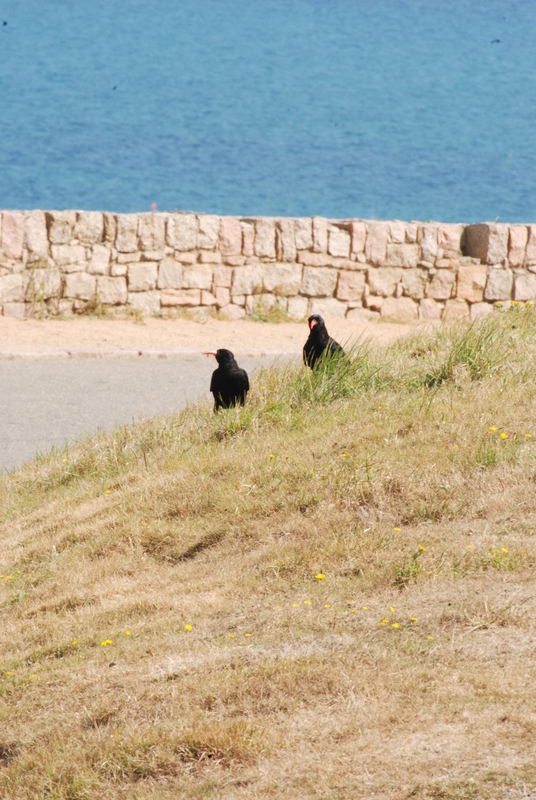 On the 21st, with an anglers’ catapult, we got insects down to the two choughs where they were and from there on they seemed to remember their training. Within a couple of days the two were hopping over the quarry fence to Ronez Point when called and getting plenty of food, and plenty of attention! Meanwhile, back in the aviary the birds were fine and continuing to respond well to the whistle. 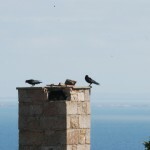 We went back to the release plans for these three birds and once again it seems that they themselves are working to their own, well planned, agenda. 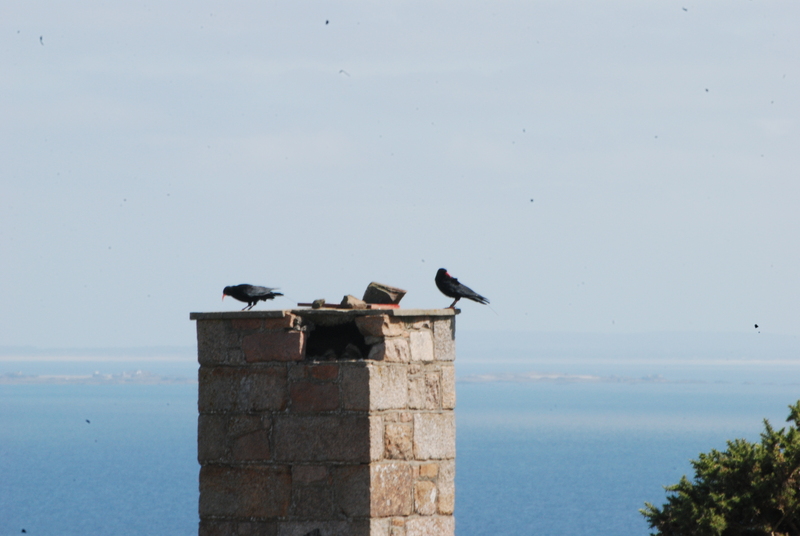 On the 23rd the three choughs went out and safely came back on call. 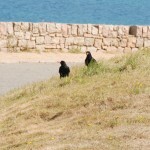 Then, the following day as the hatches were opened, MV and PG, the Ronez 2, without any hesitation, not even bothering to look around, flew straight to the quarry, passing DB and BK as they went in. They had to have planned that one! That night they once again slept in the conveyor (DB and BK have slept each night on the quarry cliffs). And………. As if the personal plans of the Ronez 2 weren’t enough to be getting on with, as I returned to the aviary to say goodnight to RD who had decided to stay indoors, DB was there waiting for me! She went straight in and joined RD after 18 nights away! 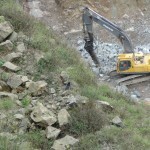 BK, however, spent the night alone in the quarry. We woke, worried about how BK was faring alone but she quickly came for food. Back at the aviary, DB weighed herself on the scales and could be seen to be at her normal weight. The Ronez 2 pair flew around a bit, ignored BK, and went back to the aviary and let themselves in. This is pretty well what they were meant to do, to go out, explore, learn about the wild and come back to the aviary for security and food while they adapt to freedom. We just wish they would all do it at the same! 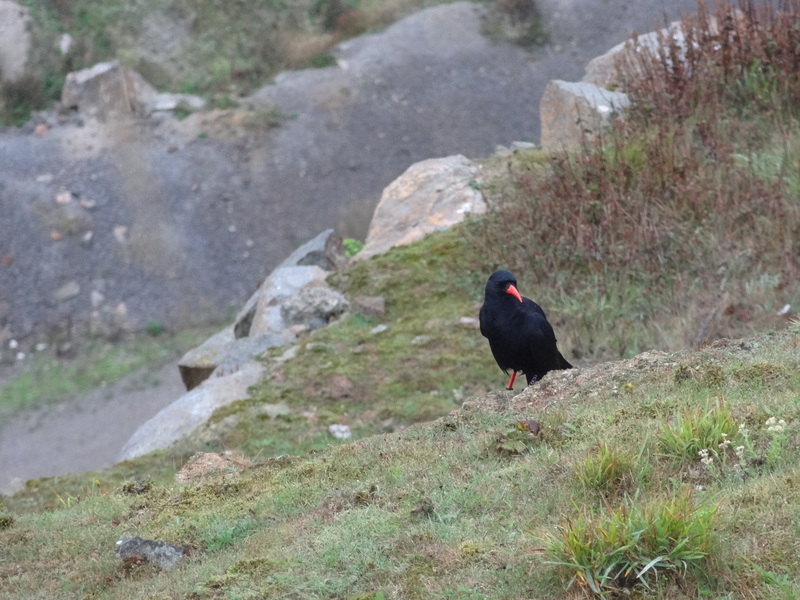 We always knew that there would be setbacks; this is a trial, a pilot study, because no one really knew how captive-reared choughs would adapt to the wild. It is becoming apparent that individual birds all have their own characters and this individuality may be the very key to their survival chances. So, while there have been some very sad and dispiriting days, we will continue with the momentum of this trial. The sight of these beautiful birds, and the interest and excitement being generated by their release, is so very encouraging. Sorry to hear of your two losses. It’s been really ‘moving’ reading…..but hold on to your last sentence Liz, and team…”The sight of these beautiful birds……..etc….” and keep moving forwards with this great project! really sad news on the losses but like you said some are inevitable. lets hope the rest carry on doing well and manage to find enough food over the coming winter months. well done Liz and team. To Glyn and the team. Despite expected setbacks, the situation nevertheless appears to be heading in the direction of positive – early achievements are always overshadowed by anxiety. It’s worth remembering that ambitious projects never succeed overnight, it’s those that take time that work best. 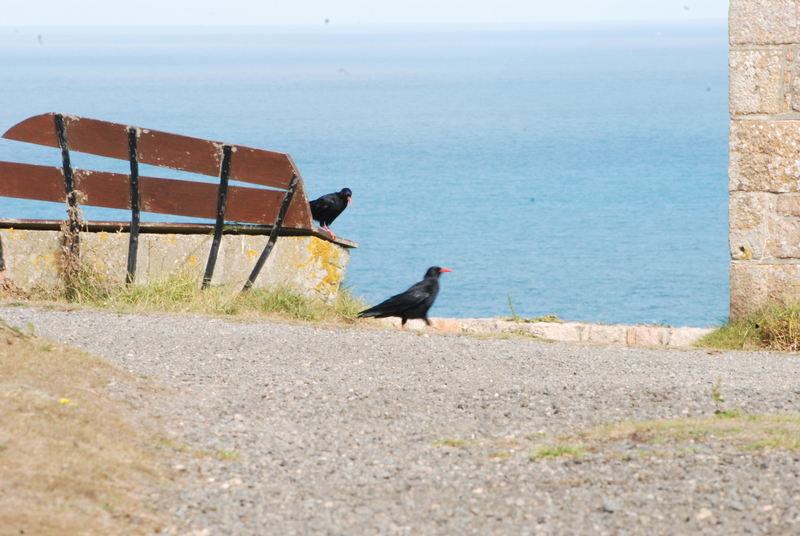 Determination and patience is a virtue they say – even for a chough!